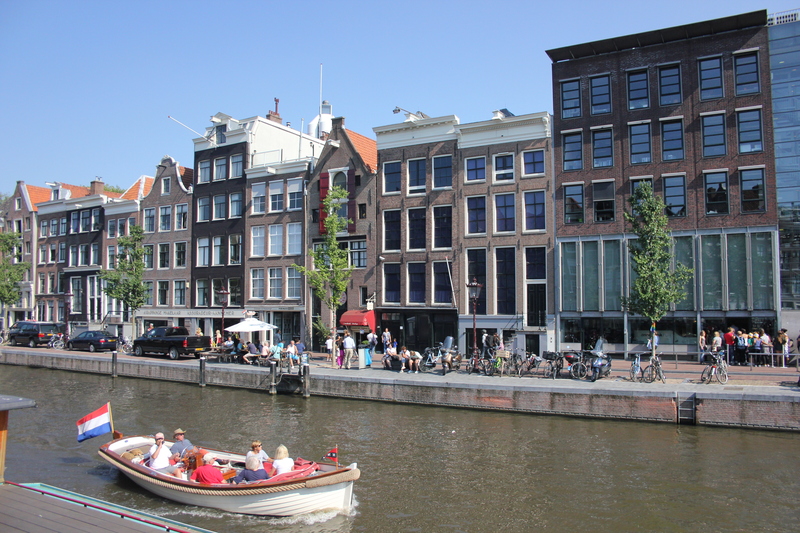 Anne Frank’s House sits to the west side of Amsterdam’s centre, fronting Prinsengracht Canal. In the bright sun this is a beautiful spot (almost a peaceful spot, were it not for the queuing crowds). It is difficult to imagine that this was the place where Anne Frank, her family and friends hid themselves away from the Nazis for two long years, only to be betrayed. “Anne Frank’s House”, the building with the secret annexe she lived in, is the one with the black shopfront, although the museum known as Anne Frank Huis now stretches across to the property next door and the larger building with high glazed windows next door to that. In early July 1942 Anne Frank’s sister, Margot, received a call-up from the Central Office for Jewish Emigration, ordering her to report for relocation to a work camp. Shortly afterwards, on 6 July 1942, the Frank family went into hiding. The building with the black shopfront was her father’s place of work. Above and behind this were rooms which were turned into a secret annexe, accessible only through an opening in a wall, hidden by a hinged bookcase which swung open to allow passage. The Frank family were joined by five others and lived in these rooms, supported and protected by friends, for over two years. On 4 August 1944, following a tip from an anonymous and never-identified informer, the Nazis raided the house, caught those living there, and deported them all to Auschwitz concentration camp. Anne and her sister, Margot, were later transported to Bergen-Belsen, where they both died of typhus. The camp was liberated only a few weeks afterwards. Their mother, Edith, remained in Auschwitz where she died of starvation. Of the Frank family, only Anne’s father, Otto, survived. It is well known that Anne Frank kept a diary about this period of her life. It was rescued after the raid and as been translated into 70 languages. Over 30 million copies have been sold. Walking through Anne Frank Huis is a strange experience. Photography is not permitted, so there are no photos to post here. The tour takes you through the commercial ground and first floors of the house, and then up into the secret annexe. The tour is self-guided, although it is so popular that from the minute you arrive to the minute you leave you are in an enormous snake of people, shuffling slowly and quietly from one room to the next. Very few people speak as they walk through the house. There is no real space for quiet reflection and thought, and the sheer number of people make it difficult to move anywhere except into the space just left by the person in front of you. The effect really is quite claustrophobic at times, and it brings home the fact that nine people had to share these very confined conditions for just over two years. The doorway to the secret annexe is like something out of a spy novel. It brings the lengths to which people had to go to escape persecution and protect their very lives. The original bookcase is there and stands open to allow visitors to pass through into the annexe. It is easily seen why it was such a good hiding place. With the bookcase in its closed position the room must have simply looked like a back room. After the War, at the request of Otto Frank, all furniture was removed from the secret annexe. Its rooms are completely bare. It is difficult to visualise what the rooms would have looked like, or even which room you are in, particularly given that there are thirty other people packed into the same small space. Suddenly, however, you realise you are in Anne Frank’s room. On the walls are newspaper and magazine clippings she herself pasted there all those years ago, the same ones she speaks about in her diary. After a completely empty house, it is particularly poignant to see these, now faded and protected by a perspex covering. As you shuffle through the empty rooms you cannot help but notice the floorboards, which creak loudly in the silence of all these people. The floorboards are one of the things that I will remember most about the house. The Franks and those hiding with her had to remain absolutely silent to avoid giving themselves away, and yet everywhere I trod floorboards cried out at my presence. I wonder if they squeaked as loudly back then. At the top of the house, the route leads back into the adjoining house, where Anne Frank’s original diary is on display and where excerpts from it can be read. There are also letters from Otto Frank and other members of the family. Some of these are very emotional, particularly letters Otto wrote to his brother, Robert, in July 1945 when he finally discovered that both of his daughters, as well as his wife, had died in the camps. 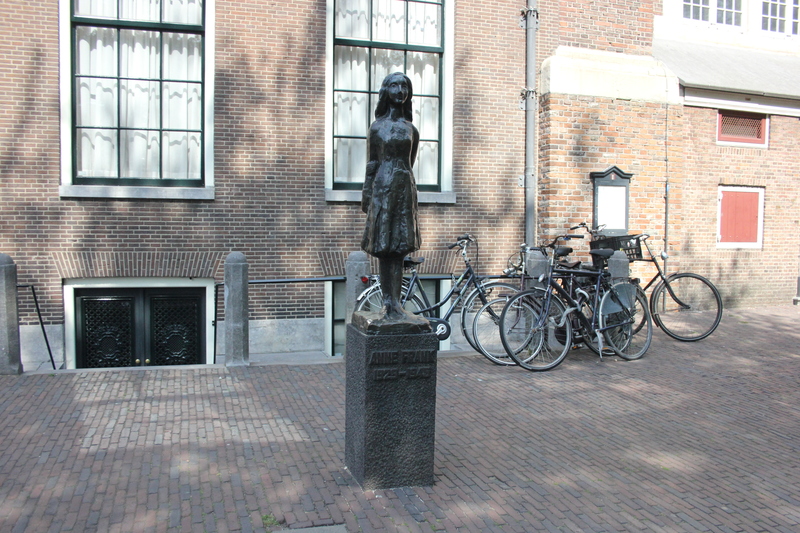 This entry was posted in Netherlands and tagged amsterdam, Anne Frank, Anne Frank Huis, netherlands, travel. Bookmark the permalink. visited Auschwitz… which for me is so hard to put into words. Nic, Great Blog. Ann Frank Museum provides one of those indelible memories that every adult should experience. Otto’s voice especially. Keeps me off the streets while you ramble around the coast!